For months, the ménage à quatre among Treasury Secretary Tim Geithner, the press, politicians, and the powers on Wall Street mystified me. Geithner’s a man with practically no business experience who has served mainly as a public servant, yet he’s been hailed by all three of those constituencies as a cross between Alexander Hamilton and J. P. Morgan. 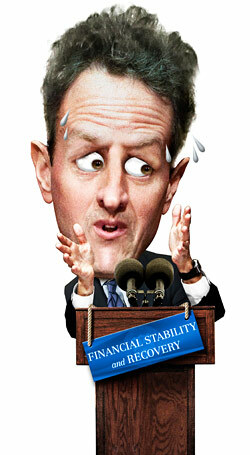 If anyone could solve the country’s myriad financial crises, the acolytes assured you, it would be Geithner. It didn’t matter that, as New York Federal Reserve president, the chief regulator of Wall Street, he gave a free pass to just about every single kind of reckless behavior that has brought this nation to its financial knees. Or that he had a major hand in letting a bank that was too big to let fail, Lehman Brothers, go under, a multitrillion-dollar mistake that the world economy has yet to recover from. Not even an outrageous series of admittedly accidental tax evasions, ones that my lawyer told me would most likely lead to an indictment had I committed them, could shake the backers of a man who makes Teflon look sticky. I know the wrath of those who have deified the Great Geithner. I’ve railed against him for months, saying that he would be a huge liability for President Obama, having been integrally involved with all of the cataclysmic decisions of the Bush economic team. Yet every time I spoke out against Geithner, one of the recently testifying dons of Wall Street would call me in for background and tell me I didn’t know what I was talking about—¬Geithner “got it.” Didn’t I know he had the brains, the savvy, the charisma to save the Obama presidency from presiding over the Great Depression II? But in just weeks, it’s all unraveled. Geithner is famous for currying journalistic favor through background interviews that erase his fingerprints from every major financial crime scene. He could take credit for the good and shunt the bad to others, and the Lassies in the press would be good to their master. Not this time. This time Geithner spoke, not through his journalistic minions or Wall Street acolytes, but on national television, telling people the sobering reality of what has yet to be done to save the system. The verdict? A near 5 percent decline in the averages, the worst bludgeoning of the year. And you know what’s ironic? I think that with this plan, he’s actually got it right. The press, the pols, the Wall Streeters—they are all dumping their golden boy just when he’s figured out how to solve the most intractable set of financial woes since the ones that landed on FDR’s desk 76 years ago. Let’s take a moment to review the mess Geithner inherited. Having been gut-shot by the mortgage-backed-securities disaster, the nation’s banks desperately need to be recapitalized in order to help money flow the way they’re supposed to. The banks also need someone to buy up the bad paper that’s still on their books so that any infusion of new capital doesn’t go up in smoke. Accomplishing those goals will cost trillions, and someone, of course, has to pay for it. That someone is either private investors or the federal government—taxpayers. Of course, you could also let banks fail. Geithner’s plan is a deft mix of all three ideas that allows the worst banks to go under while distributing the cost of saving the rest among taxpayers and private investors. Geithner knows there are only really two viable options left to us. In the first, the U.S. basically forces every bank to write down its bad loans and creates a so-called bad bank to buy up those loans on the cheap, causing mass bank failures and a nationalization of the banking system. Allowing Lehman to crater demonstrated the wisdom of allowing major failures. Deep-sixing toxic paper into a bad bank would cost taxpayers 5, 6, maybe 7 trillion dollars, as we eat (and overpay for) every bank’s rotten loans. 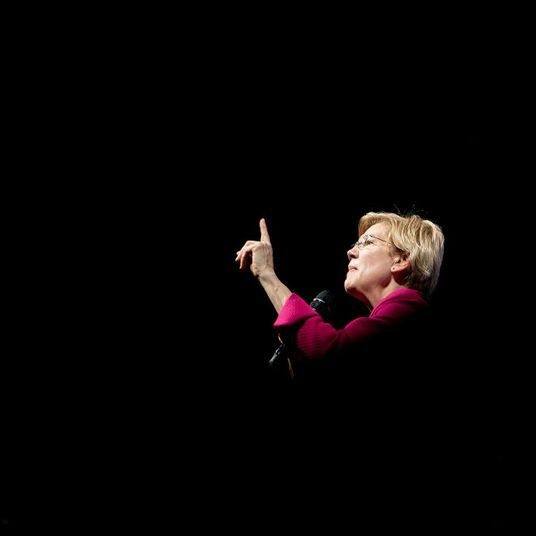 And never mind the philosophical questions about nationalizing banks in a capitalist society; the government—the same people who manage Amtrak and the Postal ¬Service—would be left to manage the banks. I know others see nationalization as an inevitability. I see it as a catastrophe. In the second option, the Geithner plan, we try to figure out which banks are worth saving, we tide them over by giving them capital, and we forbear—we look the other way for a time—regarding their capitalization problems until the nation finds its financial footing and those banks are solid again. The taxpayer pays some of the bill up front—hundreds of billions, actually—but the cost is much lower to each of us than it would be if we nationalized the major banks and crafted a toxic bank for their crummy loans. Meanwhile, we place restrictions on how banks use taxpayer dollars (limit excessive executive pay, encourage lending over hoarding), and eventually, when the economy and the banks recover, they’ll be able to repay the government. Yes, the details remain to be worked out, but the principles are sound. Geithner will institute a stress test to see who is solvent enough to get government money and who should be shut or be forced to sell to better-run institutions. By figuring out who is and isn’t worth saving, he can rally the system around a few well-capitalized institutions and shutter the rest. No more throwing good money after bad. No more fears of shaky banks choking credit. Geithner then wants to give up to a trillion dollars to a new government entity that will encourage the private sector to get involved by providing financing to vulture investors who want to buy toxic assets but lack the credit. Geithner knows that no traditional lender, no Goldman or Citigroup, will offer big money to anyone willing to take a risk that some of these so-called toxic assets might be worth something if they can just finance them, hold on to them, and clean them up until some come back to life. But lending money to such folks is a good idea, and that’s why Geithner wants the government to do it. Think of the toxic loans as land contaminated by toxic waste. Right now, no bank will give anybody credit to rehabilitate the land and sell it profitably down the road; Geithner’s Treasury wants to lend you a trillion to do so. I’ve heard the skeptics, but my bet is there’s trillions in private money waiting to jump on this option if there’s government financing. And again, this is an idea that allows taxpayers to get paid back, when many of these seemingly worthless bad loans get revived. Of course, no one knows what the lousy loans are currently worth. I think Geithner should establish a government-run fixed-income trading desk to make a market in these instruments. The big brokerage houses aren’t willing to risk working these orders, but without a real two-way market, a price to buy and a price to sell, no one can meet in the middle. All the government has to do is make such a market and provide financing to the buyers. God knows there are plenty of laid-off bond specialists out there to run a government trading desk. The banks have been loath to sell these assets at any discount from where they carry them on their books because they have to raise capital after incurring big losses to stay in compliance with the regulators. But if Geithner is willing to let the banks take the hits without regulatory jackboots coming down on them, which is what is happening now, the banks would be willing to sell. Despite what the markets said, Geithner got a lot of things right last week: His plan is big and bold, economically sound and politically viable (no nationalization, no more cost to taxpayers than absolutely necessary). If he’s as great a man as those who criticized me for knocking him say he is, then he’ll flesh out the details in the next few weeks and marshal the forces to get it through Congress. I hope that Geithner’s still got enough Teflon to see him through this brutal moment. If he does, he could wind up worthy of the Hamilton-Morgan mantle. If not, there’s a whole lot more pain in store before we’re in the clear. James J. Cramer is co-founder of TheStreet.com. He often buys and sells securities that are the subject of his columns and articles, both before and after they are published, and the positions he takes may change at any time. At the time of this writing, he owned Fording Canadian Coal Trust. E-mail: jjcletters@thestreet.com. To discuss or read previous columns, go to James J. Cramer’s page at nymag.com/cramer. Get all of James J. Cramer’s stock picks via e-mail, before he makes the trades, by subscribing to Action Alert Plus. A two-week trial subscription is available at thestreet.com/aaplus.